Guns N’ Roses fans bought more than 1 million tickets for the band’s 2017 European and Canadian legs of the Not In This Lifetime tour on December 9. According to promoters Live Nation, the achievement means the reunited trio of Axl Rose, Slash and Duff McKagan have now sold more than three million tickets in 2016, making it the year's most successful rock tour. The new figures don’t include the band’s 2017 US dates, which go on sale December 10. The stadium dates in Europe and North America will begin with a 7-week, 19 concert European trek that opens in Dublin, Ireland on May 27, with shows wrapping up in Tel Aviv, Israel on July 15. Following a two-week break, the group will launch a North America summer run in St. Louis, MO on July 27. 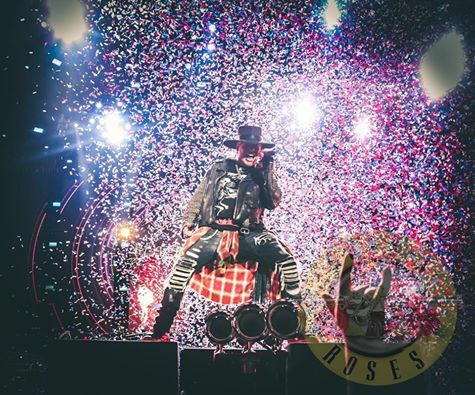 Guns N’ Roses recently completed their 2016 live schedule with a series of dates in South America.